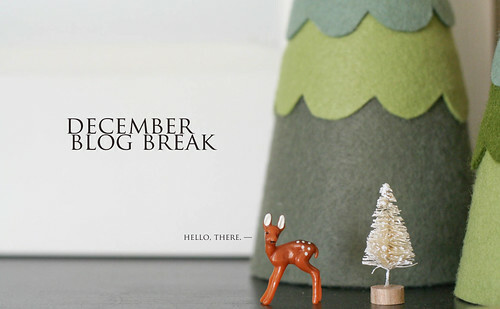 Just a little reminder that I'll be taking a break from blogging during December. (You know, so none of you think I randomly fell off the face of the earth…or something of that nature.) This year, I want to be completely and entirely present (for lack of a better word) during all the celebrations, festivities, and memories made. I feel tugged in so many directions these days, and in my search for peace I've decided a month away (to clear my head and such) is probably the best way to go. I'd like to wish everyone a very merry (and bright) Christmas season! I hope it's filled with love and laughter and more baked goods than you can shake a stick at. "than you can shake a stick at" I love you.